Keep this image in mind as you learn why not to eat the Red Herring. Here’s Greg’s post . . . The picture is pretty familiar. A dead child, either lost in a bombing or facedown on the shore of the Mediterranean. This horrifying symbol of the tragedy that is transpiring in Syria ought to make us pause, reflect, and if a spiritual person, perhaps even pray for the plight of innocents in Syria. Understanding who is “the right side” there is not even the point of this installment in the informal fallacies series, though. That most Americans don’t have a friend from the Middle East or of Middle Eastern heritage makes it difficult for them to actually interact with people who are affected–directly or indirectly–by the conflict in Syria, which makes it more difficult to actually understand what is happening there. That, however, is an issue related to our increasingly problematic insistence on seeking out sources that already agree with our worldview–called cherry-picking, by the way, a fallacy that aids confirmation bias, the tendency to believe things that support our opinions and dismiss those that don’t. However, before we even get to the proper processing of information, there is another informal fallacy people use that prohibits even getting to the point. When The Reverend posted a meme about children dying in Syria, a culture warrior who comments frequently saw it as an opportunity to preach an oft-heard sermon: children dying in Syria calls to mind the children dying in America. Is there an armed conflict in America? That would be a proper analog (comparison) given the topic of the post, but that was not the intention of the warrior. Our warrior’s point, and it’s unfortunately a tribal marker for his brand of Christianity, was that children are being aborted in our country all the time. Tribal markers, by the way, are, in the linguistic sense at least, words or phrases that are repeated by members of a group that signal membership. Think of them as verbal tattoos or verbal uniforms; commitment to them requires nothing more than the outward display of them, not the actual pursuit of a solution for the perceived problem. In other words, it’s sufficient to be verbally horrified by abortion even if the tribe member does exactly nothing except say the proper words: abortion is murder or some similar phrase. In this case, though, abortion was not the issue. Depending upon your perspective, abortion is either a right or a horror, or possibly a complex combination of the two, and I don’t care which side you prefer for now, because that’s not the point. The fallacy our culture warrior used is the red herring, and the easiest way to illustrate its definition is to use a literary analogy. I love movies about crime and detectives. The first season of “True Detective” on HBO was a grotesquely dark foray into the psychology of killer and detective, tracing the line between those who hunt and those who are hunted, never quite resolving who is the most toxic. Along the way, though, we were introduced to a series of suspects, and then given seemingly damning evidence in support of their guilt. In the detective/crime genre of literature and film, this false lead is the red herring, a person introduced into the story to throw us off the proper path. Children dying in Syria make plain the tragedy there. What do we need to do to ensure Syrian children aren’t killed? Hey! Hey! Did you see this? Children die every day in America at the hands of “doctors.” They are murdered in utero! We have a fetal holocaust! Is abortion in America a worthy topic of debate or discussion? Of course it is. Irrespective of your belief system, we should exercise extreme caution in terminating lives, and while we will certainly argue over the proper definition of what constitutes personhood, it’s good to keep in mind the words of the great philosopher Patton Oswalt, star of “Ratatouille,” who said in one stand-up routine: “Hey, we made cancer airborne and contagious. You’re welcome. We’re science: we’re all about ‘coulda’ not ‘shoulda. '” Ethical debate must always keep pace with scientific advancement. We should all agree on that point. But that wasn’t the point of The Reverend’s post. The point of dead children in Syria is an important one, and it has to be addressed as a subject separate from the death of children elsewhere who die from different circumstances. Introducing other subjects only derails the conversation; it certainly does not help find a resolution. At no point was The Reverend attempting to compare Syrian children to abortions. That move was introduced artificially by the warrior. Finish the conversation on the table first, and then move on to a different subject. That is the only strategy that allows for the proper application of reason to the problem at hand. 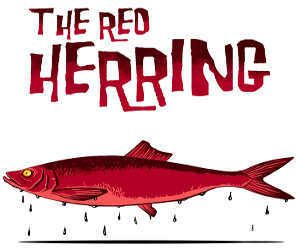 The red herring prevents the discussion from ever getting to the point, and sends it careening off in directions unrelated to the problem at hand.